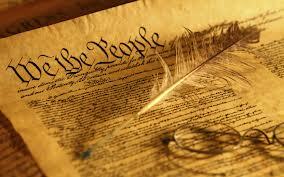 The U.S. Constitution is the founding document of American government. It is also the oldest living constitution in the world, and has been a model for other governments in the world. Test your knowledge of the U.S. Constitution with this quiz. 1. In what year did the U.S. Constitution originally go into effect? 2. In 1791, the American states ratified the first ten amendments to the U.S. Constitution. Those first ten amendments are also known as _________________. 4. The U.S. Constitution has 27 Amendments, but only 26 are in force. Why is that? One amendment barred the making, sale and transport of liquor but was later repealed by another amendment. One amendment barred the right to vote to blacks, but was later repealed. One amendment barred the right to vote to women, but was later repealed. One amendment barred the right to vote to Native Americans, but was later repealed. (e)	One amendment gave the District of Columbia two Senators and one Representative in Congress, but was later nullified by another amendment. 5. True or False? The U.S. Constitution vests the power to legislate, or create and pass laws, in the Congress and the President.